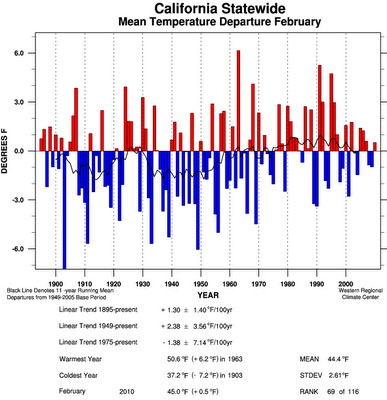 Sowell's Law Blog: Was It Really Warmer in California in February? The first of each month is an interesting day to have a look at CalClim.Dri.Edu's website, because that is the day that they (usually) update their look at the previous month, and post the average temperature deviation for that month on their long-term chart (Figure 1 below). This month, the entire state's average deviation from the long-term norm was plus 0.5 degrees F. They also update their state-wide chart with colors to show temperature for regions of the state. (see Figures 2 and 3 below). This chart (Figure 1) also has some interesting aspects that bear on the global warming issue that the State of California tells everyone is a dire emergency, and led to the state passing AB 32 to prevent catastrophic changes to the state's climate. One of the key points of AB 32 is that increased greenhouse gases, especially CO2, in the atmosphere will (not may, not might, but WILL) create global warming such that high temperatures will be experienced throughout the state. The high temperatures will (supposedly) create droughts, heat waves, public health difficulties, water shortages, and other unpleasant effects. That is the official California position. But, it appears from Figure 1 below that somebody failed to tell the month of February that little piece of fiction. The small wavy black line is an 11-year running mean, and it peaked in 1991 and has been falling steadily ever since (almost 20 years now). That is quite odd, actually, since CO2 has been steadily increasing during the entire period from about 1959. If the so-called "science" behind AB 32 were true, one would expect that each February (and the other months in each year) would react properly, and show a general warming trend as the CO2 increases. Clearly, this is not happening. Could it possibly be that AB 32 was based on bad science? Could it possibly be that CO2 does not have the magical powers that the AGW faithful ascribe to it? February has been a very cold month in Southern California, but one would not know this by looking at the overall map of the state, with each region assigned a color. In Figure 2, there is much blue and green color (colder) in the southern portion of the state, yet in Figure 3, those areas of the state are given a white color, indicating only plus-or-minus 1 degree F departure from the norm. Yet, the blue and green colors in Figure 2 indicate 2 to 3 degrees F departure from the norm. 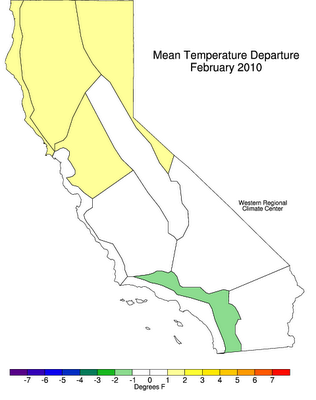 It certainly appears that Southern California, overall, was colder than plus-or-minus 1 degree from the norm, and perhaps most of that white area in Figure 3 should be light green. Once again, the entire basis of global warming, based on the increase of CO2 in the atmosphere, is shown to be false. It also appears that those who generate the overall state regional chart above (Figure 3) went to great pains to show no cooling this month, or perhaps they just ran out of green ink?